Rediff.com » Cricket » Select Team: Should India drop Jadhav, Kuldeep? Manish Pandey and Axar Patel may come in for Jadhav and Yadav, feels Harish Kotian. Play Selector and help Kohli and Shastri pick the Indian team for Wednesday's second ODI. A confident India started as the big favourites, but New Zealand stunned the hosts when the Kiwis clinched a clear six-wicket victory in the first ODI in Mumbai on Sunday. Trent Boult's pace proved too hot to handle for India's top order as they lost early wickets before Virat Kohli's 121 guided them to a respectable 280/8. New Zealand lost early wickets before Ross Taylor and Tom Latham's gritty partnership of 200 runs saw the Kiwis stage a remarkable recovery and chase down the Indian total with considerable ease. Both the Indian wrist spinnners, Kuldeep Yadav and Yuzvendra Chahal, failed to make an impression, conceding 115 runs while picking just one wicket between them in their 20 overs. A shell-shocked India may bring a few changes ahead of the second ODI in Pune on Wednesday, October 25. Kedar Jadhav could miss out on a chance to play in front of his home fans. Promoted to No 4, Jadhav scored just 4 with the bat, dropped a simple catch off Colin Munro, and Captain Virat Kohli didn't call him to have a bowl. On Monday, he was dropped from the T20I squad for the three match series against the Kiwis and unless he improves his fielding and makes more meaningful contributions with the bat, he is in danger of losing his ODI spot too. 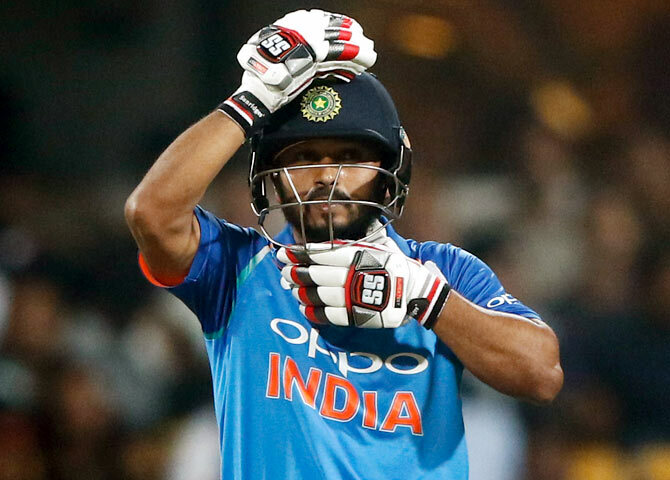 Manish Pandey, who was dropped for the first ODI, could return to the team for the second game in Jadhav's place. India may drop Kuldeep after a second successive poor outing. His place could go to left-arm spinner Axar Patel who claimed 3/38 in the final ODI against Australia in Nagpur earlier this month. Axar is a Jadeja-type bowler, who likes to keep things tight in the middle overs and forces the batsmen into making a mistake by building the pressure with his disciplined bowling. How do you think India should line up for the second ODI in Pune?